I may be off playing, but the View must go on! That's right, I am in California getting ready to board a cruise ship and if I were any more excited you'd wanna smack me a la Cher in Moonstruck. I have left my family behind to play with my friend and I am not going to feel one ounce of guilt about it. I'm certainly not going to feel like a failure because I'm missing the 2nd grade music program while I'm gone. A failure, you ask? Why would you say that? Because it's what my guest today, Olga the European Mama, writes about. 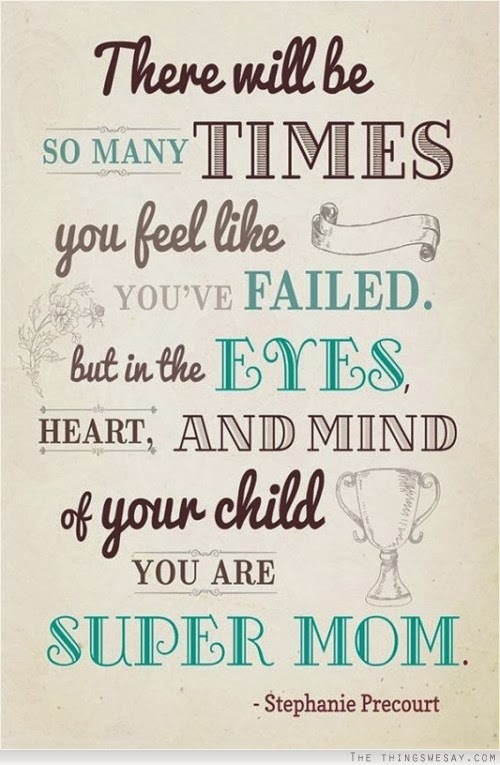 Dear mom, I want you to know, you are not a failure! I think I am reaching my limits. I haven’t slept for months. I feel empty and just so, so exhausted. I want to be left alone. I have yelled at my children more than I am willing to admit. I said no where I should have said yes. I have nudged my little girl to hurry up, even though she just learned to walk a few months ago. I have found myself asking my children: “what do you want?? ?” with tears streaming from my face. Many times I have found myself thinking that I am a bad mom, a living, breathing parenting failure. But as bad as I may feel right now, I know I am not a failure. In fact I think that I am a rather good parent. Even in my sleep deprived state I still managed to take all three of my children out for breakfast to a café one day. The next day, we made pancakes. I still find myself enjoying parenting, cuddling with my baby boy, laughing with the girls, teaching them new things. I am even raising my children to be multilingual. So I say to all moms: If you’re in the same situation, please know that one bad day (or even a few bad days) doesn’t make you a bad parent. In fact, if you worry about being a bad parent, you’re most likely a good one. You worry about your children’s self-esteem or what kind of adults they’ll end up to be. That’s a good sign, but sometimes you worry too much and blame yourself for pretty much everything. Please remember: you are not a failure. You are tired. You worry. You just want to be left alone. You want to sleep. That will get better. You will make mistakes, but you will learn from them. And you will always be an awesome parent. You were never a failure in the first place. The point Olga makes about how if you're worrying about it, you're probably not a terrible parent, is very, very true. It would only be if you were indifferent, that maybe you'd be slacking in the parental department. Indifference is rarely a good thing.